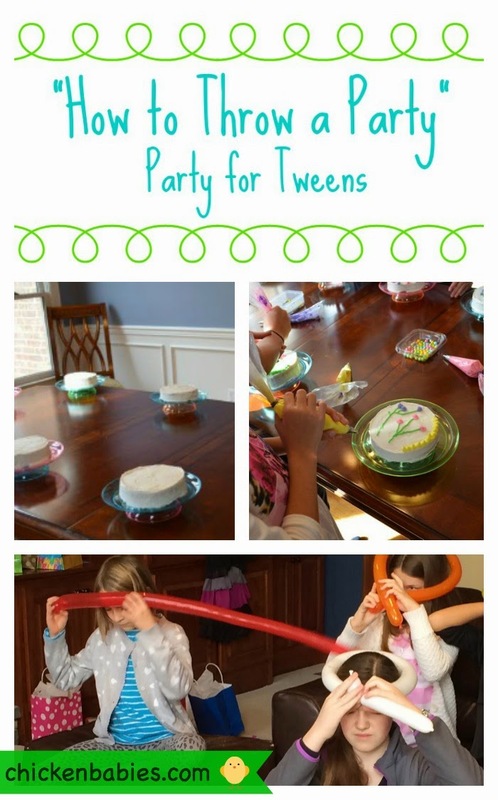 This year for Maren's birthday, we decided to throw a "How to Throw a Party" party. The girls had a lot of fun with the activities! I had originally planned on a three hour party, including lunch and time for just hanging out. But it turned out there were several events occurring I had forgotten about and we had to condense it into two hours. So I'm going to include the other ideas for the party that we had, even though we didn't get around to doing them all, but maybe you will. I like to have an open-ended craft activity going when the kids arrive so that there's something to do while we wait for everyone to come. For this party the girls decorated their party favor bags with markers and foam stickers. Once all the girls were together, we ate lunch. We had turkey croissant sandwiches, raspberries, chips, and pink lemonade. 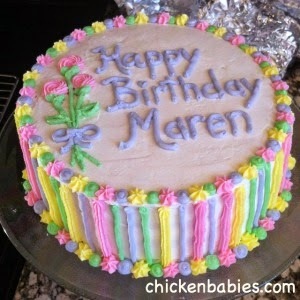 We also sang to Maren and ate her birthday cake. Now one activity I cut out because of time was having the girls decorate our house for the party. I was planning on putting them in pairs, handing them streamers, balloons, and painters tape, and letting them go crazy. I thought that would have been a fun start to the party, but alas, no time. For our first activity, I taught the girls how to twist balloons. The girls LOVED this activity. I had blown up a lot of balloons before the party started (because this takes a lot of time) and showed the girls how to make a sword, a helmet, and a flower. I used a Klutz balloon twisting book for the project ideas. Unfortunately, the book is out of print, but buying it used is a good option just so you have the instructions. And you'll need some good quality twisting balloons - the Qualetex 2x60 inch are the best. 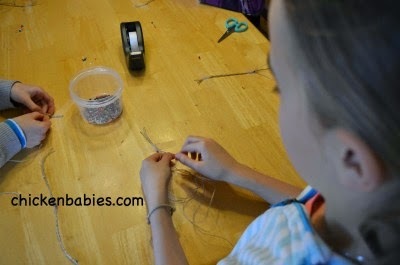 After we twisted balloons, we came back to the tables to make our party favors - wishing bracelets. The idea behind these is that you make a wish when you tie it around your wrist and then your wish will come true when it falls off. 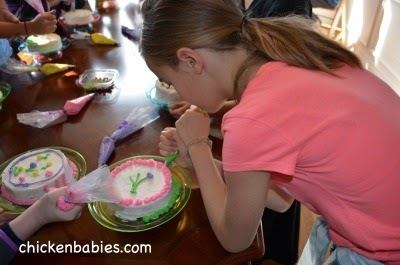 Next was the girls' favorite part of the party - cake decorating! I made 15 six-inch cakes (just one layer) and frosted them. I had seen on other blogs the idea for glueing a glass plate to a glass candlestick holder from the dollar store to make a cute little cake stand. 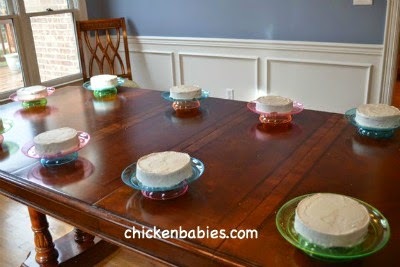 I could not find such things at our dollar store, and so instead I hot-glued a plastic plate to a plastic bowl to make cute little cake stands. They were not reusable, or perfectly sturdy, but they worked well enough and made the cakes seem a bit more special. To start, I showed the girls how to hold the bags and pipe with two different kinds of tips - the straight tip and the star tip. I showed them how to do stars and scallops. I had pre-filled a bunch of bags with colored frosting, closed tight with rubber bands, and let the girls go crazy. 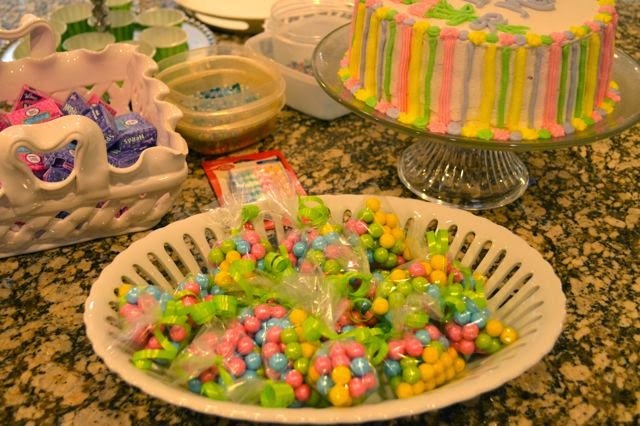 I also had a bunch of colored sixlets the girls used to decorate. They had a lot of fun decorating and I was quite impressed with their work. The other thing we were going to do but did not have time was to let the girls come up with games. We were going to divide them into teams, let them draw a slip of paper with a party theme written on it, and have a bunch of random supplies they could use to come up with a game to fit their theme. Then we were going to play the games they came up with. But there was no time. Finally, the girls collected a party bag and went home. The party bags included 5 disposable frosting bags, one of the piping tips (I just cut them off the bags and washed them real quick. They got to choose if they wanted a star or straight tip), a little bag of colored sixlets, some extra twisting balloons, their wish bracelet, some nerds (because Maren likes them), and then they took their cake home as well. All in all it was a success! 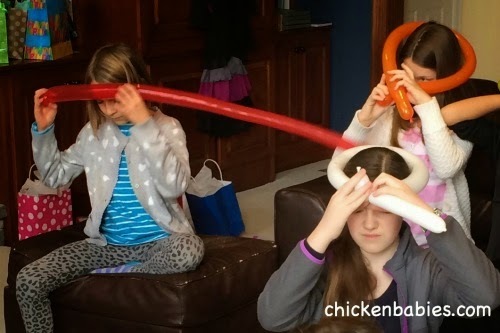 The girls had a lot of fun (and some even took up a hobby in balloon twisting). It looks like a great party. What lucky girls to get their own cake to decorate!